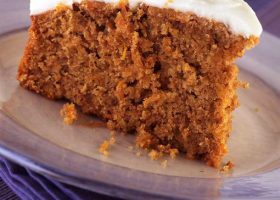 This is a delicious light cake which keeps well for up to a week and is a popular choice with adults and children alike. Lightly butter a 20cm (8”) round spring form tin and line with greaseproof paper or re-usable teflon sheet. Place flours, sugar and cinnamon in a large bowl. Place the eggs and oil in another bowl and whisk together, then add to the flour and mix well. Add the carrots and lemon juice and mix in. Spoon the mixture into prepared cake tin and bake at 150C/gas 2 for 1 hour until the centre is firm when pressed and the top is golden. Allow to cool for 5 minutes then remove from tin and place on a wire rack to cool completely. Put the cream cheese in a bowl and gradually add the sifted icing sugar. Add only enough lemon juice to make a soft, spreadable icing consistency Spoon topping onto the cake and spread with a knife.